Studies have shown that even though 88 percent of home buyers are pleased with the service provided by their real estate agent, only 25 percent actually return to them when they sell their home. This is largely due to the extensive time periods between the two transactions. Now, Homekeepr is startup that enables realtors to maintain ongoing relationships with their clients in order to keep their business further down the line, by positioning them as local experts who provide clients with a searchable database of recommended home service providers. Homekeepr recently launched a collaboration with Keller Williams Realty, the world’s largest real estate franchise, that will see the companies offering hyperlocal expertise to hundreds of thousands of homeowners. The service will be integrated into the existing Keller Williams Estate Search app, enabling clients to access home service provider recommendations on demand from their estate agent. Users can also opt to receive monthly home maintenance tips tailored to their home. 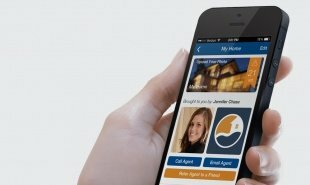 Realtors can be included in the database from USD 9.99 per month, while the app is free to use for clients. The app will help estate agents remain useful to clients after closing and help clients access reliable vendor recommendations. Are there any other professions that could share their knowledge in this way? The post App helps estate agents retain their happy clients appeared first on Springwise.